The use of posters as propaganda took off during World War I, and some of the most iconic images from this era are still in use today. For example, the image of Uncle Sam pointing at viewers and saying, "I WANT YOU," created by James Montgomery Flagg, dates from 1916 and was subsequently used throughout the rest of World War I, repurposed for World War II, and is still identifiable to many people today. The popularity of posters during World War I speaks to how effectively they could reach and influence the American people, conveying information while attempting to affect behavior. Many of the posters were commissioned by the Committee on Public Information's Division of Pictorial Publicity. George Creel, chair of the committee, felt strongly that posters would be extremely important in influencing Americans’ feelings: "I had the conviction that the poster must play a great role in the right for public opinion. The printed word might not be read; people might choose not to attend meetings or to watch motion pictures, but the billboard was something that caught even the most indifferent eye . . ."
Other organizations heavily involved in the war and war relief efforts, such as the U.S. Army, the YMCA, and the Red Cross, also commissioned their own posters from artists. The proliferation of posters put out by the government and other organizations served to motivate and influence the American people in a variety of ways. Some simply aimed to promote patriotism and to encourage public support of the war. However, many took this aim a step further by encouraging enlistment, promoting Liberty Bonds, and recruiting volunteers for a variety of work on the home front. Posters attempted to reach these goals by speaking to different audiences in a variety of ways. 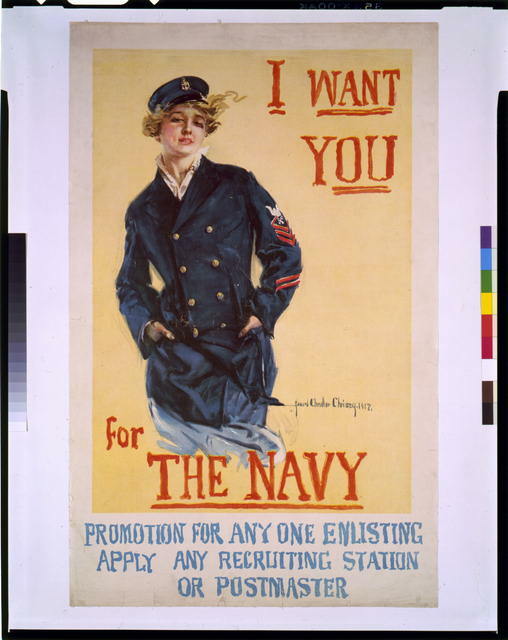 For example, to promote enlistment a poster could tell men that Uncle Sam wanted them for the U.S. Army; it could play on feelings of guilt for men who did not enlist; it could convince mothers and wives that they needed to tell the men in their lives to enlist; or it could show enticing, heroic action on the battlefield. The depiction and usage of women in World War I posters varied, depending on the goal of the organization that commissioned them. In some posters, women appeared in distress or seeking help as victims of the war. Prior to American entry, these posters functioned to sway American public opinion in the direction of joining the Allies by cultivating outrage that a country, particularly its women, had been attacked. After the U.S. entered the war, the posters depicting women as victims played on the traditionally masculine role as a protector of women in order to convince men to enlist in the armed forces. In other posters, women were portrayed as seductresses, inducing men to enlist in the military through their sexualization. A prime example of a war poster using women to seduce men to enlist is the U.S. Navy's "I Want You" poster, created by Howard Chandler Christy. An attractive young woman dressed in nautical garb angles her body toward the viewer, giving a sultry gaze as her hair wisps away. The poster says, "I Want You for The Navy," but the girl seems to be the one saying "I want you," instead of the poster itself. Unlike the posters that portray women as victims, passive observers of the war, or seductresses, many of the World War I posters show women taking a much more active role in contributing to war efforts. For example, many of the Red Cross posters (oftentimes soliciting donations or seeking more volunteers and nurses) show nurses in the thick of the conflict, carrying stretchers with wounded soldiers, caring for the soldiers, and attending to families displaced by the war. These women are portrayed as strong, courageous, and patriotic, thus promoting the work of nurses and the Red Cross and prompting other Americans to likewise lend their support. Posters showing active, patriotic women were also used on the home front to promote and recruit for war efforts in America. These posters, like the Woman's Landy Army one pictured below, show women in their home front jobs, typically appearing enthusiastic and further promoting the home front efforts. Additionally, the women are usually depicted as "'ordinary' women . . . in order to set an example for potential participants in war-related activities" in America. Allegorical women also appeared in World War I posters, most often representing a country such as France or America, or representing certain national ideals or goals such as liberty, victory, and justice. Many of the posters featuring allegorical women were aimed at recruiting men for the armed forces, although when not soliciting enlistment, the posters also targeted women. Aside from featuring women, many of the posters included in this section highlight the wartime organizations that contributed to the war effort, such as the Red Cross, the War Camp Community Service, and the YWCA, many of which were run by women and/or whose volunteer base was largely composed of women. Please note that the Archives Center at NMAH is in the midst of digitizing their vast poster collection, so images may not be available for all of the posters included in this section—check back soon! David Haberstitch, “Memories of a wartime poster model,” O Say Can You See? Stories from the National Museum of American History (blog), October 12, 2010. Elizabeth Prelinger and Barton C. Hacker, "'The Spirit of Woman-Power': Representation of Women in World War I Posters," in A Companion to Women’s Military History, ed. Barton C. Hacker and Margaret Vining (Boston: Brill, 2012), 453–484. Eric Van Schaack, "The Division of Pictorial Publicity in World War I," Design Issues 22, no. 1 (Winter 2006): 32–45. Jia-Rui Cook, "The Posters That Sold World War I to the American Public," Smithsonian Magazine, July 28, 2014. Michele J. Shover, "Roles and Images of Women in World War I Propaganda," Politics & Society 5, no. 4 (December 1975): 469–486. World War I Posters at the Library of Congress. World War I Posters at the U.S. Army Center of Military History. "World War I Posters: The Graphic Art of Propaganda," LIFE.com. "Your Country Calls! : Posters of the First World War" at The Huntington. George Creel, as quoted in Eric Van Schaack, "The Division of Pictorial Publicity in World War I," Design Issues 22, no. 1 (Winter 2006): 33. Elizabeth Prelinger and Barton C. Hacker, "'The Spirit of Woman-Power': Representation of Women in World War I Posters," in A Companion to Women’s Military History, ed. Barton C. Hacker and Margaret Vining (Boston: Brill, 2012), 464. 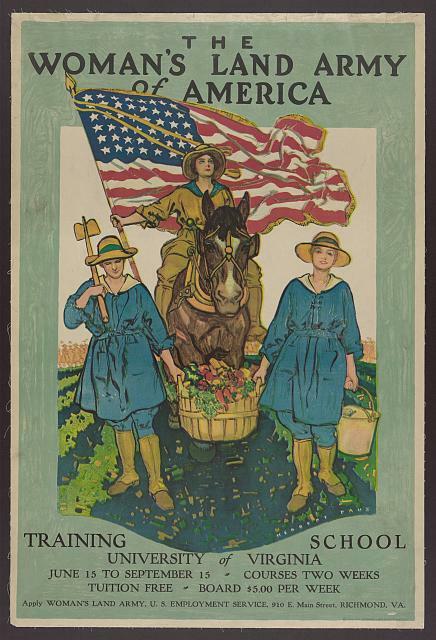 Herbert Andrew Paus, "The Woman's Land Army of America," 1918, Photos, Prints, Drawings, Library of Congress, JPEG file, http://lcweb2.loc.gov/service/pnp/ppmsca/13400/13492r.jpg (accessed April 30, 2015). Howard Chandler Christy, "I Want You For The Navy," 1917, Photos, Prints, Drawings, Library of Congress, JPEG file, http://lcweb2.loc.gov/service/pnp/cph/3g00000/3g02000/3g02000/3g02010r.jpg (accessed April 30, 2015). 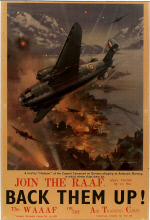 Join the R.A.A.F Back Them Up! Image of the bombing (by Bristol Blenheims) in daylight of the power station at Knapsack, Germany by the Royal Air Force. Relief Halftone/Screen print. Throughout their history, posters have been a significant means of mass communication, often with striking visual effect. Wendy Wick Reaves, the Smithsonian Portrait Gallery Curator of Prints and Drawings, comments that "sometimes a pictorial poster is a decorative masterpiece-something I can't walk by without a jolt of aesthetic pleasure. Another might strike me as extremely clever advertising … But collectively, these 'pictures of persuasion,' as we might call them, offer a wealth of art, history, design, and popular culture for us to understand. The poster is a familiar part of our world, and we intuitively understand its role as propaganda, promotion, announcement, or advertisement." Reaves' observations are especially relevant for the impressive array of aviation posters in the National Air and Space Museum's 1300+ artifact collection. Quite possibly the largest publicly-held collection of its kind in the United States, the National Air and Space Museum's posters focus primarily on advertising for aviation-related products and activities. Among other areas, the collection includes 19th-century ballooning exhibition posters, early 20th-century airplane exhibition and meet posters, and twentieth-century airline advertisements. The posters in the collection represent printing technologies that include original lithography, silkscreen, photolithography, and computer-generated imagery. The collection is significant both for its aesthetic value and because it is a unique representation of the cultural, commercial and military history of aviation. The collection represents an intense interest in flight, both public and private, during a significant period of its technological and social development. Lockheed "Hudson" dive bombing U-570; text block at bottom. Relief Halftone/Screen print. Whenever possible, the museum provides factual information about copyright owners and related matters in its records and other texts related to the collections. For many of the images in this collection, some of which were created for or by corporate entities that no longer exist, the museum does not own any copyrights. Therefore, it generally does not grant or deny permission to copy, distribute or otherwise use material in this collection. If identified, permission and possible fees may be required from the copyright owner independently of the museum. It is the user's obligation to determine and satisfy copyright or other use restrictions when copying, distributing or otherwise using materials found in the museum's collections. Transmission or reproduction of protected materials beyond that allowed by fair use requires the written permission of the copyright owners. Users must make their own assessments of rights in light of their intended use. If you have any more information about an item you've seen in the Fly Now: The National Air and Space Museum Poster Collection, or if you are a copyright owner and believe we have not properly attributed your work to you or have used it without permission, we want to hear from you. Please contact pisanod@si.edu with your contact information and a link to the relevant content. Join the R.A.A.F. - Back them Up! Image of Lockheed Hudsons (one in foreground, others in background above city and port in flames) raid German ships, Aalesund, Norway. Relief Halftone/Screen print. American Red Cross / Our boys need sox / Knit your bit. American Red Cross. Poster. Date span information was found in: Rawls, Wake Up America, p. 129. Illustration: A basket of yarn with knitting needles sticking into it. Red Cross nurse American Red Cross. Poster. Date span information was found in: Rawls, Wake Up America, p. 127. Illustration: Red Cross nurse reaching towards the reader while American soldiers march by in the background. The comforter. American Red Cross. Poster. A Red Cross nurse holding a baby and comforting a weeping woman. Nurses of America!!! The lives of our soldiers and sailors depend on you / Will you enroll? The American Red Cross. American Red Cross. Poster.